Could Soundmagic’s E11BTs be our new favourite budget Bluetooth headphones? | What Hi-Fi? SoundMagic has launched the E11BT in-ear headphones, Bluetooth versions of the wired E11C we recently awarded a five-star review to. The new £70 neckband-style headphones expand the E11 family further, joining the E11C, E11 (no three-button mic) and E11D (digital USB-C) variants. The E11BTs use the latest Bluetooth 5.0 connection (although they aren't aptX), boast a 20-hour battery life, and feature an in-line, three-button control and microphone. The speaker and acoustic chamber has been upgraded over the one found in the E10 family, and SoundMagic says their aluminium housings and 'flexible' neckband have been built to last. SoundMagic has become a household name in the affordable in-ear headphone market over the years, winning several What Hi-Fi? Awards for its E10 models. 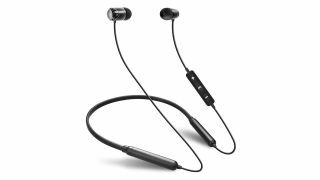 So with that, and the E11C’s success, in mind, we wouldn’t be surprised if the E11BTs became our new favourite budget Bluetooth buds. That said, they’ll have to surpass the quality of their four-star predecessors, the E10BT, as well as the five-star Beyerdynamic Byron BTs (£80/$76) that currently set the benchmark below £100.